Dymatize Elite Fusion 7 Protein Review - Amazing Taste! The Most Amazing Taste For a Protein Shake! Elite Fusion 7 is a protein complex that consists of a blend of - you guessed it - 7 different sources of proteins. This is a product that is designed to keep fueling your body with high quality proteins over a longer period during the day where you could use it as a post workout shake, or simply take it as a protein snack in between your regular meals. 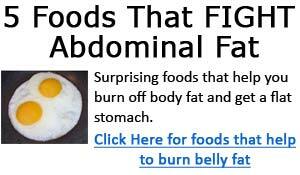 The different protein content contained offers fast and slow digesting proteins. 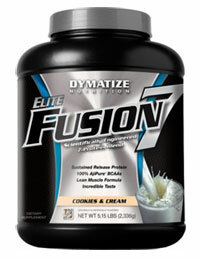 Dymatize Elite Fusion 7 is fairly similar to Gaspari's Myofusion - in terms of nutrition content. However, between these 2 quality protein blends, I have to say that Fusion 7 wins by a slim margin - in terms of price and taste. Did I mention that this is a product with amazing flavors?! The cookies and cream flavor is an absolute winner! But more on this in a bit. When it comes to picking protein powders, there are countless choices on the market. I've tried a majority of them, and I know a quality product when I see one. I try not to be biased toward any particular supplement or brand, but I have to admit that I do really like Dymatize products. They're quality products, taste great, and the prices are more than reasonable. And no, I'm not getting paid to write this. This supplement also has a very favorable nutrient profile where 1 serving gives you a good 23g of quality proteins (again from 7 different sources), 5g of BCAA, and 5g of fiber. If you look at the product label above, it shows that there are 11 grams of carbohydrates per serving. On first look, this might seem a bit high for a protein powder, but with a more detailed look, you'll see that of those 11g carbs, it contains 5 grams of fiber and only 1g of sugar. With each serving, you're getting 190 calories, 6g fat, 23g protein, and 11g carbs. Aside from that, you also get varying amounts of vitamins and some trace minerals. You Can't Go Wrong With The Amazing Flavors! Fusion 7 comes in a 2.91lb tub, 5.15lb tub, and a 10 serving taster package. Its flavors include banana, chocolate PB, cookies & cream (!! ), vanilla, mochaccino rush, rich chocolate, and strawberry. As far as flavors go, I've tried the mocha rush, rich chocolate, and cookies and cream. The mocha rush seems to get a lot of great reviews, and it does taste good, but I was hoping that the coffee taste would be a lot stronger. Overall the mocha rush flavor tastes very good, perhaps slightly on the lighter side, and could use another dose of coffee taste. (Yes, I like the coffee taste). The rich chocolate flavor is on par with mocha, but if you ask me, it's the cookies and cream flavor that is absolutely the best! For whatever reason, the cookies & cream flavor rating isn't all that great at bb.com, but I think it's by far the best tasting! I've tried quite a few different cookies & cream flavors from different products, but nothing quite comes close to this one from Elite Fusion 7. This is one flavor I just can't seem to get enough of. The sweetness is just right, tastes creamy and delicious, and those tiny, crunchy cookie crumbs mixed in with the shake seals the deal! Try it, you won't be disappointed.